Get an instant estimate of the cost of cutting your grass. Note - We strongly recommend that you read the guidance for measuring your lawn area, below. This is intended for use by customers and staff of Shetland Grasscutting. If you work for a gardening firm who might like to use LawnCalc, email admin@lawncalc.com for further details. Guidance for measuring your lawn. How long is a metre? About a yard, or approx the length of a normal, average walking pace (not a long stride, nor a short step). Eg, a lawn 5 strides wide, by 10 strides long, = 50m2. Sketch a quick map. Break your lawn into logical sections, and for each section, write down and multiply together that section's width and length. Then, to get the total m2, add together all the sections. Careful with your arithmetic. A common mistake is to lose a zero when multiplying large numbers together. 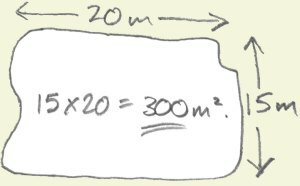 Eg, an area 50m by 50m is not 250m2 - it's 2,500m2. Awkward shapes. A circle, triangle or oblong is trickier than a rectangle. The easiest way is try to imagine how big it would be, if it WERE a rectangle. Approximate measurements of the trickier areas of your lawn are fine, so long as the total's not significantly inaccurate. Only measure the lawn. This may sound obvious, but exclude your house, driveway, etc. E.g., an area of lawn 5 strides wide, by 10 strides long, = 50m2. 10 strides wide, by 15 strides long, = 150m2. 15m x 20m = 300m2. 20m x 30m = 600m2. 30m x 40m = 1,200m2. 40m x 60m = 2,400m2.